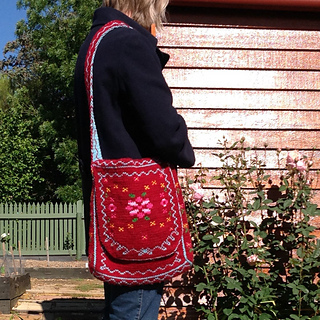 This colourful, double-knitted, self-lined shoulder bag is inspired by folk art. There’s plenty of scope here for different colour schemes and yarn types – with a bag like this, exact tension matching is not required. My version holds A4 pages and magazines. The bag is knitted all in one piece then the sides joined with slip-stitch crochet. The handle is knitted as part of the bag then joined using grafting. The finished bag is 35.5 × 31.5 cm (14 × 12.375 inches) not including the handle. The length including the handle is 80 cm (31.5 inches). The sample is knitted in Morris Estate 8 ply (available at http://morrisandsons.com.au/c1_341_1694) but the pattern includes suggestions for the more readily available Cascade 220 Sport.